While many pokies have bonus features, there’s now a couple of games from Aristocrat that have bonus on top of bonus features. Games such as Sunset King and 5 Frogs give players an additional boost to their bankroll when these are triggered, and although only a couple of pokies are given the Super Feature treatment at the moment, it’s sure to be rolled out across more of their range in the future. The exact details of the features varies from game to game so it’s really just about the principle of adding extra rounds or bonuses, rather than a specific enhancement, but they certainly add an extra dimension to each pokie. These games are found at land-based casinos and are currently not available online, which is a shame because even without the Super Features, these are high quality games and anyone without easy access to a casino will be missing out. How Do Super Features Work? 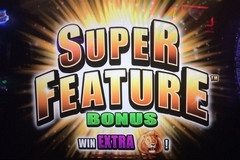 There’s no missing the Super Features when they are triggered, as the words will be splashed across the reels in an animated sequence, but as each game has different ones, let’s take a look at a couple of Super Feature examples and how they work across some of the biggest pokies. 5 Frogs is an Oriental-themed game that has 5 reels and Aristocrat’s Reel Power system that replaces paylines with winning combinations formed whenever 3 or more matching symbols land across adjacent reels running from the left side. The symbols that players will be most keen to see are the Ying and Yang, which takes them to a free spins game with multipliers. At least 3 of these are needed to trigger the round, but if 4 or 5 appear, then the Super Feature is also in effect. The 5 Frogs of the title are wild symbols and anytime they complete a line during the free spins games, the value of the win is multiplied several times over. Assuming the Super Feature has been triggered, players get to pick how volatile they want their free spins to be, meaning they can either have lots of free games, where the multiplier is relatively low, or just a few spins where there’s potential for big winnings with higher multipliers, but of course fewer opportunities in which to get it. Normally, each option has 3 different multipliers attached to it, but if the Super Feature is in play the lowest multiplier is removed and extra spins are added. For example, players could pick 15 free spins with 5x, 8x or 10x wild multipliers, but the Super Feature will first take the number of spins up to 21 and then remove the 5x option, so players will always get the bigger wins and more chances to hit them. Following the popular African wildlife theme, Sunset King has symbols like a giraffe, zebra and hippo joining the lion who gives his name to this 5 reel pokie. It’s got 4 rows of symbols across them, to give 1,024 possible ways to line them up, in what Aristocrat calls Xtra Reel Power. The Super Feature comes in the free spins game, which is triggered by 3 or more paw print scatter symbols. 10 free games are awarded, but if the Super Feature is in play, then lots more of the high-value lion symbols will be added to the reels, making it much easier to get multiple winning spins throughout them. It’s all done with some impressive animations which builds the anticipation as lion after lion is added. Once the spins have begun, players are likely to see this symbol taking up large parts of the reels, and while it takes 3 scatters to start the free spins, it only takes 2 during them to re-trigger the round, with a further 5 spins added to the end of any still to play out. The Super Features in these games are an added boost to some already decent bonus rounds, in some pokies that stick to tried and tested themes and formats to attract the widest possible audience. Found in the Helix cabinets, that have big screens and a simple design for ease of use, 5 Frogs and Sunset King are straightforward games that are ideal for new players to get their teeth into, as there’s nothing complicated about lining symbols up on adjacent reels to get a winning combination. Wild substitutions and scatter payouts are standard features across most pokies, and the free spins games are highlights whether or not the Super Features are in effect.